In honor of all my undergrad people returning to SUNY Cortland (aka Candyland) this weekend, I'm sharing one of my most favorite crafts I made as a sorority chick. Traditionally, a "little" makes their "big" a decorated paddle with Greek letters, a meaningful message, their pledging year, or over-the-top ornamentation. I was brainstorming some good birthday gifts for my boyfriend and remembered him telling me that because his new little (lol) transferred to a different school, no paddle for him. I went to the Greek Store and purchased Alpha Phi & Pi Kappa Phi wooden letters as well as the standard size paddle my sorority uses for big / little, picked up PKP's white, gold, and royal blue paints. 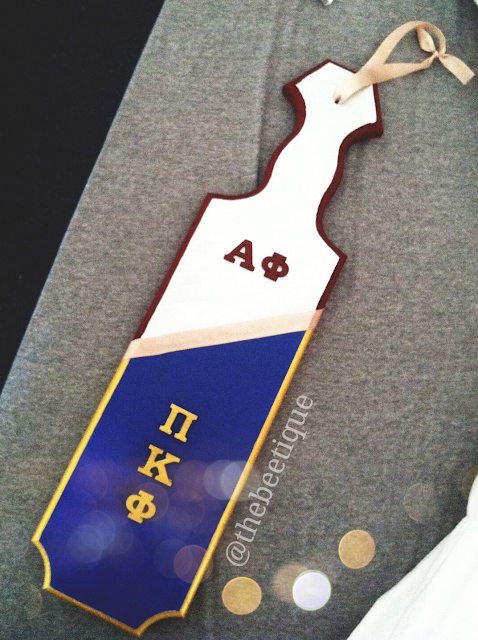 Originally I planned on making a regular Pi Kapp paddle, but decided I'll make it Pi Kappa Phi & Alpha Phi. Because, well, we the best. Whether you have a friend or boyfriend in Greek life, your sorority has a brother fraternity on campus, or you're just a flat out groupie, go ahead and paint away. This is a perfect inexpensive DIY gift for a birthday, anniversary, or Valentine's Day, which is quickly creepin up on us. Great timing. 3 comments on "Sorority // Fraternity Paddle"
I would like to appreciate the author for coming up with such a well written post all description are awesome about Fraternity paddle.